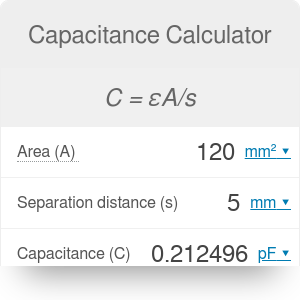 This capacitance calculator is a handy tool when designing a parallel plate capacitor. Such a capacitor consists of two parallel conductive plates separated by a dielectric (electric insulator that can be polarized). Read on if you want to find out what is capacitance, and how to calculate it using the capacitance equation. It is the ability of an object to store electric charge. It depends only on geometry of the capacitor and on choice of the dielectric material in between the plates. In most cases, it does not depend on the potential difference or the charge stored on the plates. s is the separation distance between the plates. The permittivity depends on the dielectric material used. By default, this capacitance calculator uses the value of 8.854 pF/m, which is the permittivity of vacuum. One picofarad (pF) is equal to 10^(-12) farads. Determine what material will be used as the dielectric between two plates. In this example, we will use vacuum. Once you decide on the material, find out its permittivity - here, 8.854 pF/m. Choose the area of plates. Let's say it's 120 mm^2. Measure the distance between the plates - we will assume 5 mm. Insert all values into the capacitance calculator. It will find the value of capacitance for you! In our example, it is equal to 0.212 pF. You can check the corectness of calculations with the capacitance equation. capacitors in parallel follow the same rules as resistors in series. Interested in electricity? Check out our Ohm's law calculator. Capacitance Calculator can be embedded on your website to enrich the content you wrote and make it easier for your visitors to understand your message.